Preheat oven to 375 degrees and coat 2 whoopie pans (nine each) with non-stick spray. Add Kodiak mix, milk, eggs, 1/4 cup of sweetener, and oil into a large bowl or stand mixer. Mix on high until smooth. Fold in half of the crushed Oreos. Pour into prepared pans and bake for 15-18 minutes. Remove from oven and let cool. Prepare filling by adding heavy cream and vanilla to a stand mixer. Beat for 30 seconds and slowly sprinkle in sweetener. Whip until fluffy. Gently fold in remaining crushed Oreos. Place in fridge for 10-15 minutes. Assemble whoopie pies by adding 2-3 tablespoons of whipped cream to the center of one cake. Gently press another cake on top. 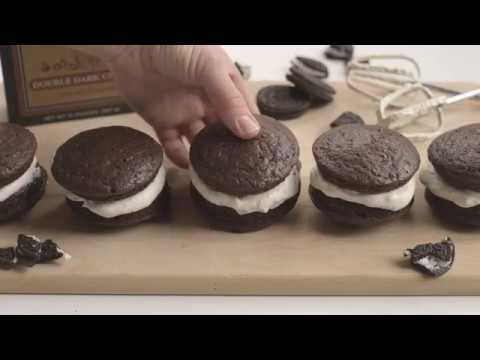 Place all whoopie pies into the fridge to set until you are ready to serve.